It’s been one whole year since we went on the most amazing adventure. And it’s taken me that long to get around to writing about it. 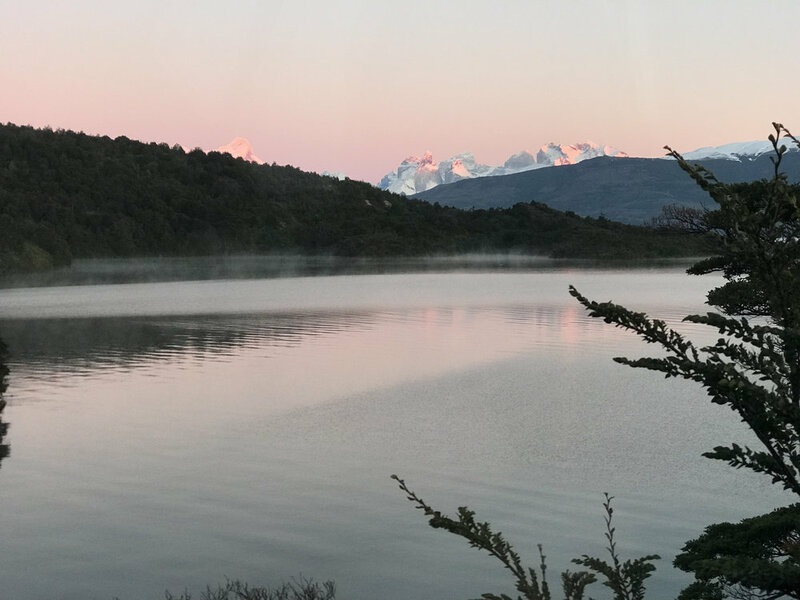 I was devastated when we left Patagonia Camp, our home for six incredible days in the Chilean wilderness. 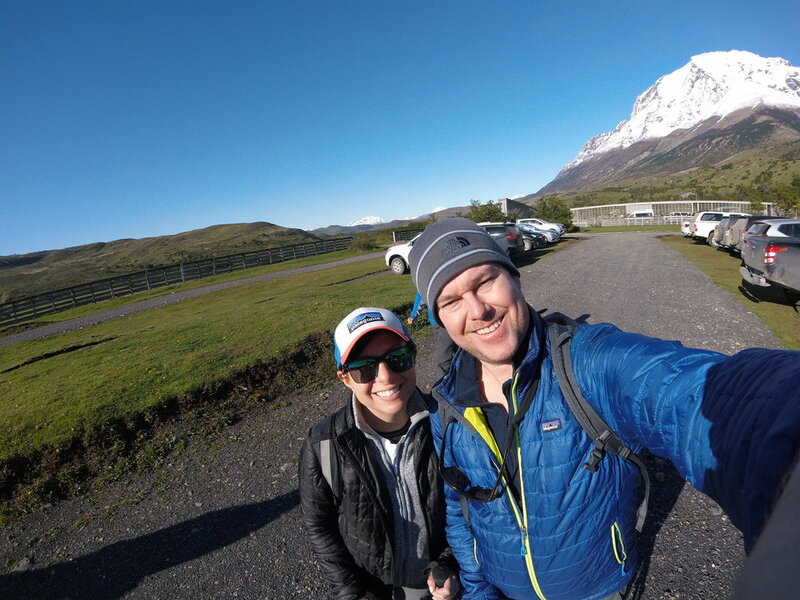 We slept in a yurt, drank local wine, kayaked in a glacial lake, trekked to the Patagonia base towers, and befriended people from all over the world. It was like spending a week at a magical, grown-up summer camp. And it was eye opening. I’ll spend the rest of my life chasing the way I felt in Patagonia. And how on earth do I even attempt to capture the wonder and exhilaration of a trip like that in a blog post? I still don’t know. I think the best I can do for now is to recap, day-by-day, each of our incredible adventures. Thankfully, we took lots of pictures. After a long (34-hour, three flight) trek down to the southern tip of Chile, we settled in for a night at Hotel Cabo de Hornos in Punta Arenas, a tiny coastal fishing town. With charming town squares, friendly local dogs, and a surprisingly delicious culinary scene, we could have easily spent a few days exploring Punta Arenas. But, we had to settle for brunch at the hotel and a quick downtown stroll. Well, it was more of a scavenger hunt – my hair straightener didn’t like the converter I was using, so I had to buy a new one. We were able to track one down at a small shop that sold washing machines and cell phones. It was a great test of our abysmal, but somehow passable, Spanish skills. We hopped aboard a large van destined for Patagonia Camp later that morning. After a marathon day of travel, the four-hour ride into the park flew by. We chatted with our fellow passengers – a couple from England, a father and his two sons from Mexico, and a pair of doctors from Singapore. They all marveled at how brief our trip was, as most of our group had planned to spend at least a month in South America. “You Americans don’t get much vacation time, do you?” our charming new British friend asked sympathetically. About halfway through our journey, we stopped at a cozy coffee house in the middle of nowhere. I could have sat at that sweet wooden bar by the roaring fire all day long. Brian and I opted for Chilean beer over coffee because we were on vacation. It was the right choice. 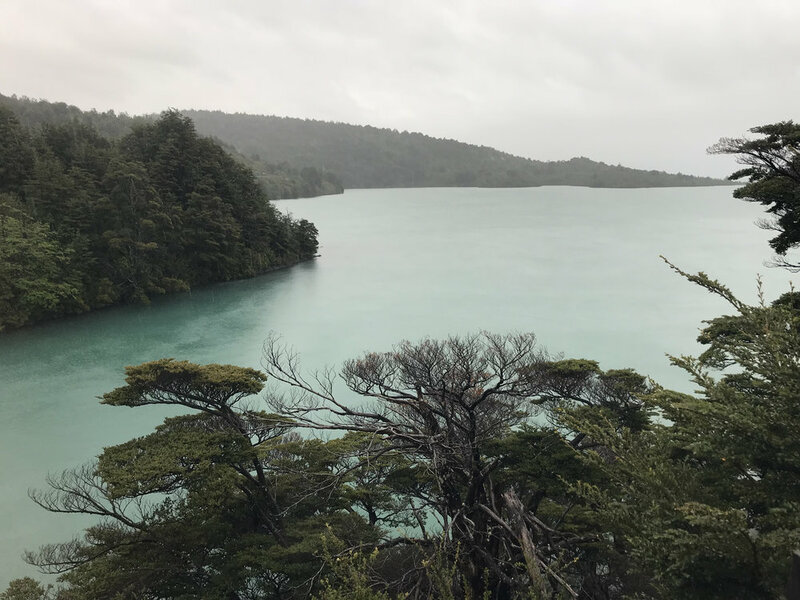 Four hours later, we were bumping down a dirt road under a sign that read “Patagonia Camp” set against a glistening turquoise lake (Lago Bonita) framed by green trees. We’d arrived. As the van doors flew open, we were greeted by Oliver, the front desk manager. “Welcome to the end of the earth” he said, a huge smile on his face. It really felt like that’s where we were. And, if you look at a map, you’ll see that Oliver wasn’t exaggerating. We followed a winding path made of wooden planks, elevated a few inches off the ground. We’d later learn that everything at Patagonia Camp was built with the intention of disturbing the existing foliage as little as possible. At the end of the path, we found the lobby, which also houses the bar and dining room. With Pisco Sours in hand, the front desk staff got us checked in to our respective yurts and reminded us that orientation would begin at 5 pm that evening. This is the view from the drive into Patagonia Camp. The yurts at camp aren’t your average yurts. We had a private attached bathroom, stunning views, and the most comfortable bed I’ve ever slept on. Not to mention the daily maid and laundry service. I was in heaven. Each yurt has a radiator, attached bathroom, and tons of cozy blankets. Orientation was held in the guide’s office across from the lobby. Christian, the lead guide treated us to a presentation featuring all the excursions and activities available while we sipped wine and nibbled on appetizers, exchanging excited glances with our friends from the bus ride. There’s an endless array of hikes to go on and sights to see in Patagonia, but the crown jewel is the trek to the base towers. The only problem is, the weather can be a little tricky that far south of the equator. With rain in the forecast for the next few days, we’d have to keep our fingers crossed that conditions for a hike of that magnitude would be better by the end of the week. In the meantime, Brian and I decided to book a kayaking excursion, a horseback riding adventure, and a nature walk (in hopes of spotting a puma – or at least some guanacos). The yurts overlook Lago Bonita. On a clear day, you can see the base towers in the distance. This is the view from the deck off the main dining room. After an incredible night’s sleep, we awoke to a stunning view, pulled on a bunch of layers, and trudged into the dining room for a hot breakfast and lots of coffee. It was raining and cold, but I didn’t care. I couldn’t wait to go kayaking among the icebergs of Grey Lake. Our guides seemed to be just as excited as we were. That’s something we found on every adventure we went on that week. The people who live and work in Patagonia love what they do. And I think they’re some of the happiest people I’ve ever met. We were joined by a couple from Houston, who were excited to find that they could watch the Astros play in the World Series back at their hotel. As much fun as we’d had making friends with people from around the world, it’s (almost) always nice to bump into fellow Americans. We had a lot of fun with them. 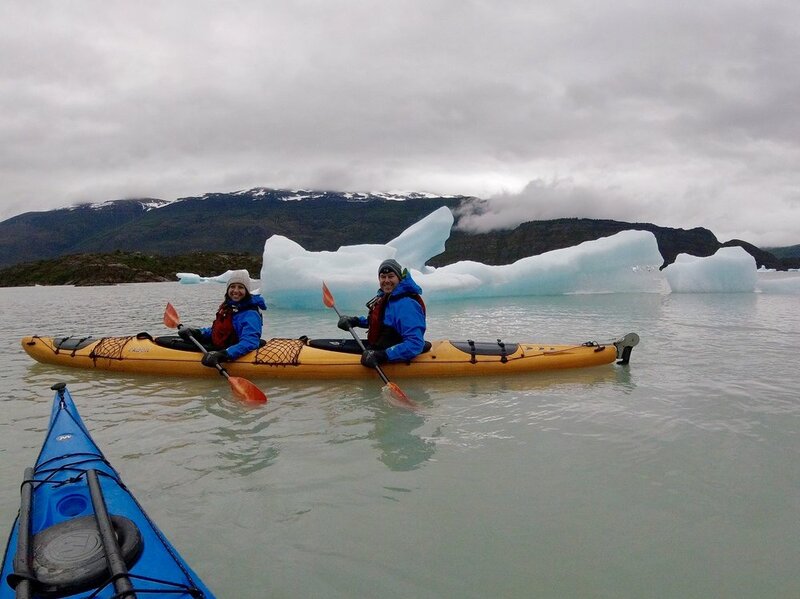 Kayaking around the icebergs in Grey Lake. Icebergs, it turns out are kind of sticky. And obviously very cold. You have to be careful when paddling around them, as they can break off or flip over with little warning. And you don’t want to capsize in a glacial lake! When lunchtime rolled around, we settled in for a picnic on the beach. Huddled under a tarp, Leslie distributed sandwiches and hot chocolate, as we proceeded to ask her a million questions about life in Patagonia. With full bellies, we were ready to launch into the second half of our day: kayaking down the Grey River. And by the way, the water in the lake and river is actually grey due to the sediments in the glacial melt. And it’s beautiful. The water is also so clean that you can drink it. Which we did. Our guides served up sandwiches, cookies, and hot coffee! There was a moment when we were floating down the river with towering rocks on either side of us that I realized I was living in a magazine photo shoot. Seriously, this is the kind of thing you see in a travel magazine, but never think you’ll actually get to do. We hit a few rapids (so fun) and wore out our arms paddling, wearing huge smiles on our faces the entire time. When we finally reached the end of our journey, we quickly changed into dry clothes and toasted a successful adventure with Chilean beer. That night, freshly showered and donning our best flannel, we enjoyed another fantastic dinner in the cozy lodge. We wound up at the bar for a nightcap and were treated to a visit from Raphael, the hotel manager. A former captain in the Chilean cavalry, Raphael had left the military to manage Patagonia Camp. For him, this was a dream come true. And we could see it in his eyes. He absolutely lit up as he talked about the place. We probably could have chatted with him all night, but he was pulled away to assist a drunken group from Brazil with getting back to their yurt safely. We couldn’t seem to find a bad view from Patagonia Camp. Patagonia is famous for several things, but one of the biggest draws is the elusive puma. Their main source of food is the guanaco, a llama-like fluff-ball that lives in giant harems along the grasslands. So, we decided to go for a hike among the guanacos along the fauna trail, in hopes of spotting a wildcat. The drive from Patagonia Camp into the park was full of beautiful sights. If you look over our shoulders, you’ll spot a gorgeous turquoise lagoon! I’ll save you the suspense – we never did see a puma. But, the hike was beautiful. We saw ancient cave drawings, beautiful birds, and tons of guanacos. Our guides were also incredibly knowledgeable and told us all kinds of fun facts about the guanaco (they have designated “potty spots,” use sentinels to guard the herd, and will let out a blood-curdling scream if they spot a puma). It was another cold, rainy day, but again, we just didn’t care. The park is so beautiful, the guides were so engaging, and our fellow travelers were so interesting that the cold wind and steady rain fell away. We also befriended a couple from Seattle on this excursion. He was a Vietnam veteran, and she was a self-proclaimed hippie. They were awesome. Even on a cloudy, rainy day Patagonia was gorgeous. This waterfall is fed by melting glaciers! That night, the staff hosted a happy hour on the large deck between the guide office and the lobby. We mingled with our friends from the bus ride in, our Seattle pals, and an entrepreneur from Argentina. When dinner rolled around, a group of us decided to push all our tables together. It ended up being one of the most fun nights I’ve ever had. There’s something special about swapping stories with people from around the world, learning about each other’s lives and shared interests. We laughed a lot. It was magical. Another cozy evening in the dining room at Patagonia Camp. The dining room serves a breakfast buffet, lunch, and dinner every day. The food was delicious! At breakfast the next day, something had shifted. I felt like this place was my home. I couldn’t wait to get to the dining room to compare itineraries with our new friends and to make plans for dinner that night. Our guide Christian getting our horses ready for a ride through the Serrano Valley. Brian and I were excited to learn that our pals from London would be joining us on our horseback riding adventure. We drove out to a picturesque ranch in the Serrano Valley. Our guide, originally from Switzerland and her assistant, a real-life Chilean cowboy, got us suited up and ready to ride. But first, we got to meet a newborn baby foal. He was just one day old. My heart melted. The spot where the Serrano River and the Grey River meet! Our horses were kind enough to carry us along a sparkling river, and we got a good look at the point where the Grey River and Serrano river meet. You can actually see the grey and turquoise water blending together. It was beautiful. Overlooking the beautiful Serrano Valley. Christian insisted that I try on his riding gear. I’ve never felt cooler than when we trudged across a flooded river and through the lenga tree forest. My horse, Amadeo wasn’t too thrilled about it, so I was sure to thank him profusely. Brian’s horse, Melon, on the other hand, was a wild man. He happily trotted through water, mud, and trees. Melon wasn’t the kind of guy to worry about getting his hooves dirty. At the end of our ride! This was the first day that we saw the sun, which was a welcome sight, given our hopes to trek to the Patagonia base towers the next day. The weather cleared up so much that by the afternoon, we were able to go for a paddle on the lake at Patagonia Camp. The water was perfectly still. I know, it doesn’t look real. But it really looked like this! That evening, we met a couple who’d just arrived from Washington, D.C. They were our age, funny, and sarcastic. Our kind of people. The next day, we ended up spending the entire fourteen-mile roundtrip hike to and from the towers with them. When I was at my most exhausted, their jokes about our shared suffering helped keep me going. Raphael, the Patagonia Camp manager told us about this spot along Lago Bonita. I could have sat there all day! We woke up early the morning of our big hike and headed to breakfast. The dining room was buzzing with energy, as about half of the camp was planning to make the trek to the towers that day. The weather had finally cleared up, and conditions were perfect. We’d totally lucked out. The morning of our hike to the base towers. We woke up to a clear view of our destination! We had no idea what we were in for! When we arrived at our starting point, the sun was shining, and the air was crisp. And I had no idea what I’d gotten myself into. The hike was long and grueling (you can read my in-depth thoughts here), but ultimately totally worth it. This was easily the most stunning hike I’d ever been on. The water is so clean that you can drink it! We refilled our water bottles along the way. About a quarter of the way through the hike. We made it! We were exhausted, delirious, and so happy. That evening, we stumbled into dinner exhausted, but deliriously happy. 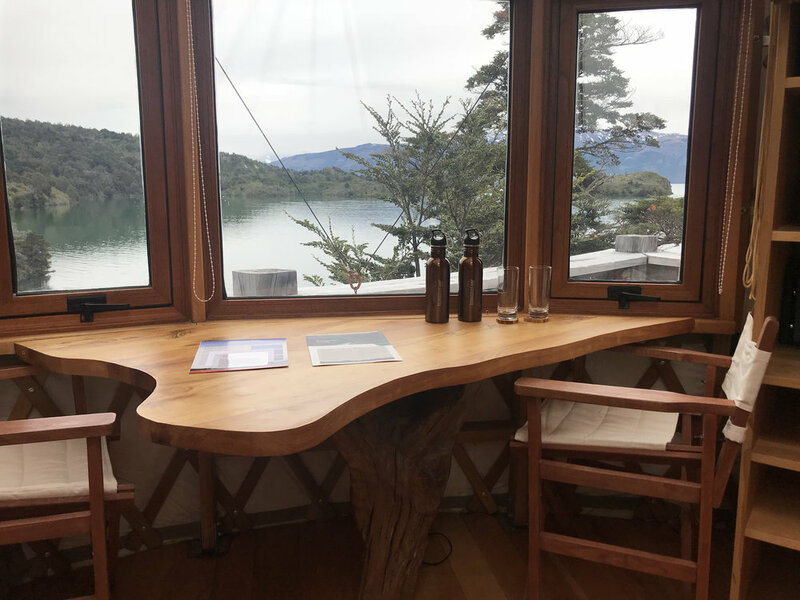 With tables pushed together and glasses of wine in-hand, we recapped the week’s exploits with our Patagonia family. Most of us were leaving the next day, so the night was bittersweet. Even though we were all beat, everyone seemed hesitant to turn in for the night. We weren’t quite ready for this magical adventure to end. Taking one last look at Patagonia Camp. We packed up our things, bid a misty-eyed goodbye to our yurt, and boarded a bus bound for Punta Arenas. Exhausted and fighting the beginning of a cold, I was still so sad to leave. But, my heart was full. We’d experienced one of the most beautiful places on the planet, befriended people from all over the world, and had a blast together. It was honestly one of the happiest weeks of my life. 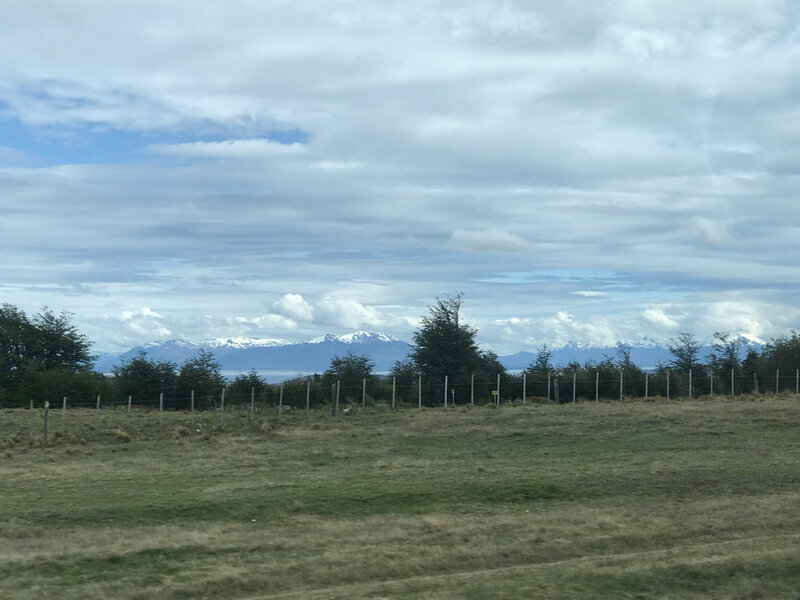 After departing Patagonia Camp, we spent another night in Punta Arenas, visited the penguins who reside on an island in the Magellan Strait, explored Santiago, and made the most of a layover in Mexico City. All the while, we were more than a little sad that our Patagonian adventure was over. Honestly, I’m still sad that it’s over. I went to Patagonia expecting to live out an incredible adventure. But, I didn’t expect to meet so many awesome people. It was inspiring to spend time with people who were living out their dreams, or checking off an adventure on their bucket list, too. And the bond that we shared that week is something I still can’t really explain. Kind of like summer camp. Only with really great wine and no drama. If you have an extra few minutes on your hands, you can watch a quick video of our trip below. Brian captured some awesome GoPro footage from our kayaking and horseback riding adventures!